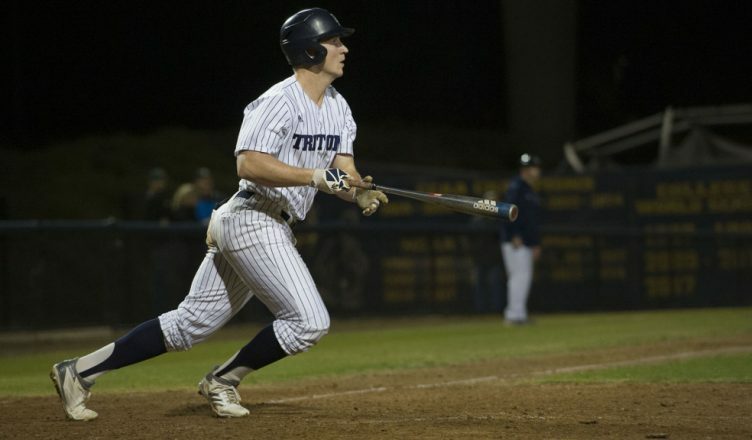 This week, the UC San Diego baseball team opened its series against California State Polytechnic University Pomona. Of the two games played — one on Thursday and one on Friday — the Tritons lost the first and won the second. In an upset performance, the No. 14-ranked Cal Poly Pomona shocked the No. 7-ranked Tritons, operating well against a higher-seeded opponent. After these two games, UCSD’s record moved to 10–5 (6–4 in California Collegiate Athletic Association standings). UCSD started the series with a disappointing 8–3 loss. Despite the end score, the opening game started off slowly. In the first three innings, the score remained 0–0: The Tritons had 2 hits, while the Broncos had 1. However, in the fourth inning, Cal Poly Pomona blew up, scoring 4 runs off of three hits. The Tritons finally scored in the fifth inning with 2 runs: 1 by junior right fielder Zander Clarke and the other by freshman designated hitter Blake Baumgartner. The Broncos’ first lead would extend to the end of the game. Cal Poly Pomona racked up 4 more runs by the ninth inning; the Tritons were unable to respond, scoring only 1 run. In a tight second contest, the Tritons were able to hold off the Broncos to win 6–4. Much like the first game, this game started off very slowly; the game was scoreless going into the sixth inning. In the sixth, UCSD recorded the first points of the game (a run by freshman shortstop Shay Whitcomb) and took a 1–0 lead. In the next inning, the Tritons lit up the scoreboard, earning 4 runs off of 3 hits and 1 error. Cal Poly Pomona, however, mounted a resilient comeback attempt, taking the game all the way down to the ninth inning. At the top of the ninth, the Tritons were up 6–4. The momentum seemed to be in the Broncos’ favor as they had just scored 3 runs in the ninth; for Cal Poly Pomona, the game was still within reach. UCSD junior pitcher Preston Mott put an end to the Broncos’ comeback, striking out their last hitter and sealing a UCSD victory. UCSD will finish out the series against Cal Poly Pomona with two more games against it this weekend. Next week, the Tritons head to Rohnert Park, CA to play Sonoma State University.